Three years ago, I married my best friend. Can you believe that it’s already been a total of 8 wonderful years with my DH? So the story of this tasty libation begins a little more than three years ago, when everything for our wedding was planned and ready to go – months and in some cases years in advance (thank you OCD!). We only had one thing remaining on our checklist…the signature drink. What do you serve as THE signature cocktail for your wedding reception when the weather forecast says that it’s going to be a balmy 30C (86F)? A classic mojito recipe uses muddled fresh lime and mint with rum as the alcohol of choice. Other ingredients include simple syrup and club soda. In our version, we decided to use tequila instead and change things up a little (because being predictable is kinda boring). The result is that we ended up creating a drink that was oh so refreshing and delicious in the August heat. As a side note, in recreating this recipe – I looked all over for my bottle of bitters. How does one misplace a key cocktail ingredient in the house? I mean really?! Geez Louise. So, I had to go purchase a new one*. Now what is Angostura Bitters you ask? Well…it’s a blend of aromatic herbs and spices that is used to flavour food and drinks. It adds spice, complexity and helps to bring out the flavours in a beverage. Angostura Bitters was originally developed as a tonic by Dr. Johann Gottlieb Benjamin Siegert, and its top-secret recipe is apparently known by only five people. This fantastic ingredient is also reported to be a great remedy for upset stomachs** and hiccups. 1. 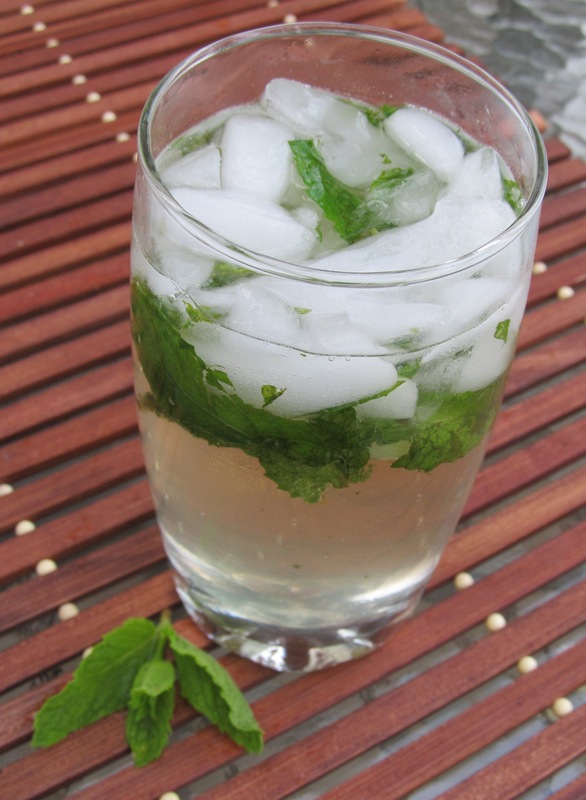 Place a handful of mint leaves and lime wedges in a glass. 2. Muddle using a pestle, then add ice. 5. Stir to distribute everything in the glass (makes it look pretty). 6. Garnish with mint sprig…then sit back and enjoy! * I had heard rumours that there was a shortage in 2009, and after hitting 7 different locations in town was literally pulling my hair out in frustration. You can normally find it in the grocery stores beside the Grenadines and lime/lemon cordial. I love Mojitos. I’m going to make this. Yum. Thanks so much. Btw, I love your wedding photo. I’m warning you….these are highly addictive and delicious.